Instrumentalists Unwed Sailor have garnered comparisons with the likes of Low, Tortoise and the Dirty Three, which aren't that far off the mark. However, there's something more here, a reminder that there was a time when alternative music was all like this - truly alternative. Unwed Sailor have the spirit that largely disappeared somewhere around the mid-90s, a spirit that infused the days when the likes of Red House Painters and Dinosaur Jnr ruled the roost. In the days before alternative broke through with Nirvana, no-one in the scene really had any kind of commercial sensibility because alternative music existed on college radio stations and across tape-swapping networks. It never really sold any copies! As a result, anything could come out - alternative was eclectic, unpredictable and exciting. 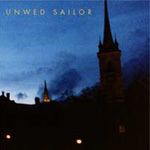 Unwed Sailor is a refreshing reminder of those days, their melodic constructions, dominated by the kind of indie guitar playing that has always contrasted strongly with the heavy metal show-offs, will probably never sell a million copies. But, they might do something better, they might gain a real fanbase, people unconcerned with fashion or trends, people who really care about the music. The way it should be.